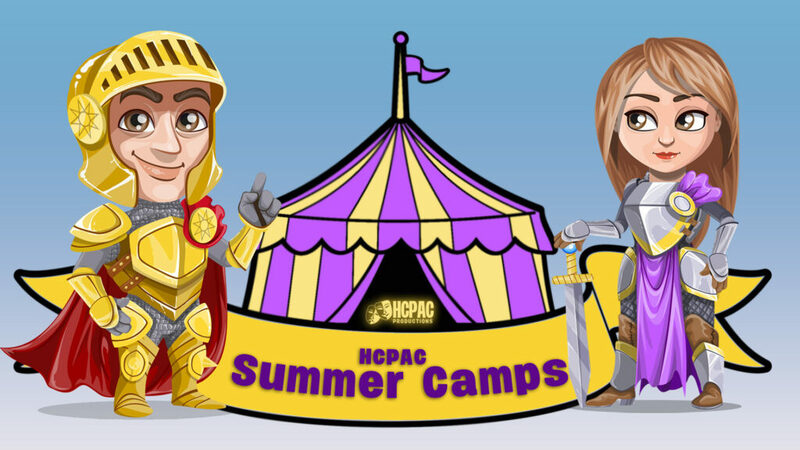 This summer, why not join HCPAC for one (or more!) of our three fun-filled camps? During each two-week camp, students will utilize critical thinking skills as they sample many parts of a theatrical production through games, crafts, songs and an introduction to theater basics. Each student will more fully develop key life skills such as oral communication, teamwork, commitment, self-discipline and healthy self-image as they work together with other students to produce an end-of-camp showcase. Students entering 1st grade through entering 6th grade are invited to attend. They will be asked to do physical things like climbing, reaching, and lifting. If any of these activities would be a problem, please let us know in advance. The cost is $250 per student and there are scholarships available. Please email our Executive Director at swebb@thehcpac.org for information on scholarships. Camp registration fee includes all materials, snacks, camp souvenir photo and free admission for family and friends to the end of camp showcase. Students registering by June 1, will receive a free camp shirt. * Nutritious lunch included each day at this location only. A Participant Medical Form must be filled out for each student prior to the start of camp. Once you have filled out the form, please send it to HCPAC in one of these ways: scan it and email to hcpac@thehcpac.org; mail it to HCPAC, 1000 S. Eisenhower Blvd, Middletown PA 17057; or drop it off in our office.